Multiplayer videogames tend to bring out the worst in me. I have a temper. I have cursed at and been cursed at, and I’ve flown into Achillean rage during Mario Kart 64: “Sing, O Goddess, the rage of Yoshi / after he was blasted by a Blue Shell." During one particularly heated game of NBA Jam, I pushed my competitor off the couch we were sharing and said some quite rude things about former Chicago Bulls small forward Toni Kukoc. 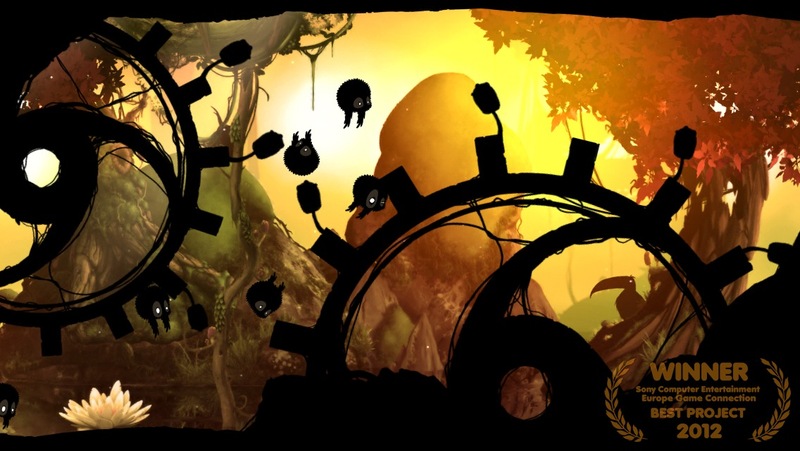 But I’ve never punched anyone over a game, nor has anyone ever punched me — until I downloaded Frogmind’s Badland ($0.99). Badland is the debut effort from Frogmind, a Finnish duo who cut their teeth on RedLynx Trials series. It is, like so many App Store games, a one-button physics game: touching the screen causes a troupe of silhouetted gremlins (I always called them “little fatties" in my head) to fly forward and upward; releasing your finger allows them to float to the ground. It’s our job to guide the afro-sporting fatties through a perilous swamp rigged with booby traps, buzz saws, pneumatic pistons, and spinning fan blades designed to slice, dice, explode, impale, smush, and otherwise destroy them. With its stark silhouettes and tendency toward quick, brutal death, Badland lends itself to Limbo comparisons, but it’s more similar to games like Mekensleep’s cult hit Soul Bubbles or 2D Boy’s World of Goo [$4.99]. In each level, you’ll find power-ups that “clone" your character, and several of the puzzles depend on splitting your flock and sending them down alternate paths to push levers or collect important items. In extreme cases, it might be necessary to sacrifice dozens of clones so that one might slip through some hellmouth toward the end of the level. Other power-ups include, say, shrinking your flyers, or speeding them up, or coating them in sticky goo. These are pretty common platformer conceits, but Frogmind gets a lot of mileage out of its physics engine, simple controls, and basic structure; bolstered by extra, optional missions, striking, parallax-scrolling environments, and lush art direction. 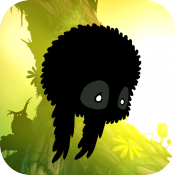 Badland is never particularly forthcoming in explaining its various mechanics or in telegraphing traps or dangers. The art style hides any number of bombs and toxic spores, and Frogmind are content to let players figure it out. And so it is with Badland‘s hint of narrative: woodland creatures and malevolent machines watch your progress, but you’ll be left to puzzle over any hints of a story on your own. Frogmind’s focus on intricate physics, trial-and-error, and repetition shouldn’t be surprising given their past work on Trials, but Badland isn’t quite as well-equipped to handle that type of game. The one-touch control scheme is ideal for iOS games generally, but Badland‘s capricious physics engine and controls are fine-tuned in such a way that no two runs are ever feel quite the same, and similar-seeming inputs don’t always produce the intended effects on-screen. As a result, it can be hard to locate problem areas or learn your way through a given puzzle. And even when you find a solution, actually executing it is another matter. Especially in the beginning, playing Badland is an exercise of balancing frustration with the thrill of seeing (somewhat arbitrarily) the stars align as you guide your fatties to freedom. 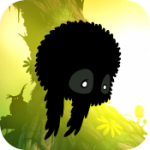 Indeed, plenty of Badland seems to play itself: the levels auto-scroll, the power-ups govern most of the interesting things you can do with your flyer, and some of the levels can be completed with minimal input at all. There are times when Badland is just a cool physics toy with a smart sense of timing. That’s not a bad thing — Badland mitigates its difficulty by giving players a chance to relax and enjoy its art and kineticism. 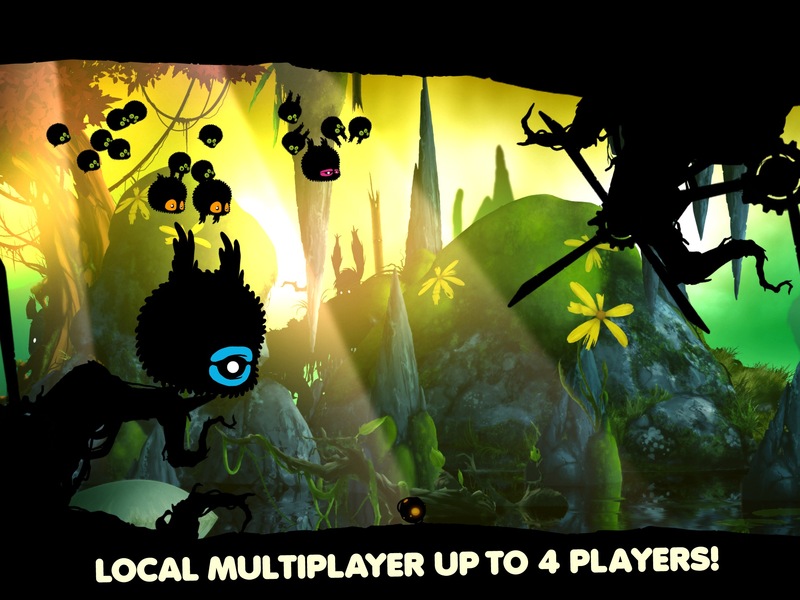 As I mentioned earlier, Badland features a local multiplayer mode: up to four players can guide their own color-coded fatties through a number of levels. Points are scored for finishing the race first and for finishing with extra clones. Like everything else in Badland, other players’ characters are physics-enabled, which means I can, for example, push them into a group of sawblades and cackle as they make an audible pop. This kind of behavior is exactly what got me punched in the chest, which speaks to the fervor, intensity, and excitement Badland engenders. 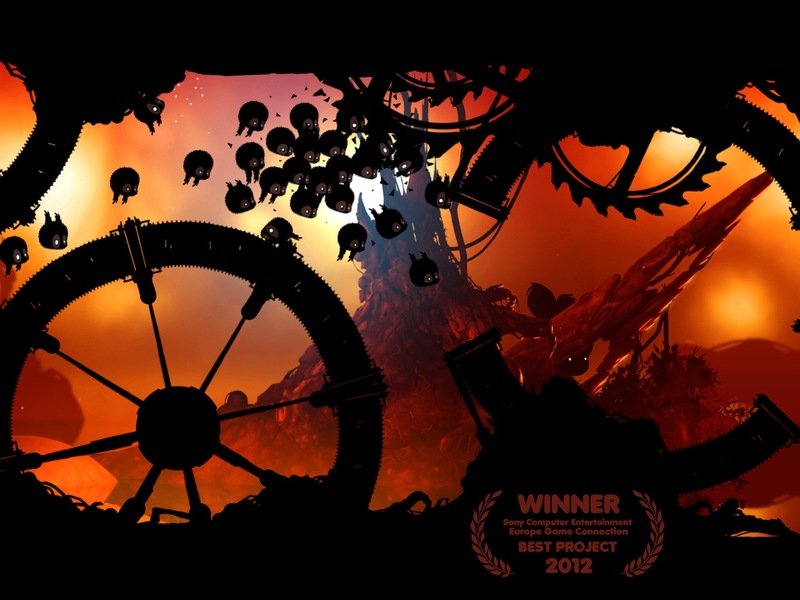 In fact, everything that makes Badland‘s single-player difficult — the hidden traps, the finicky controls, the unpredictable physics — makes its multiplayer a blast. There is a way to win, of course, but it’s mostly just a vehicle for screwing with other people. It’s fast and frenetic, and the short levels can be strung together into longer rounds for more sustained schadenfreude. The game’s simple controls means that anyone can play, and its unpredictability keeps any one player from dominating a match. 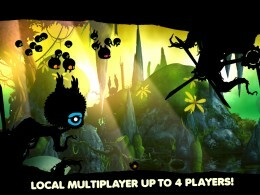 That’s not to say that Badland‘s multiplayer is the main draw or the focus of the game, but adding an extra human player changes the entire tenor of the game, even though the mechanics stay the same: the single-player portion is somber and delicate, but the multiplayer is frantic and bombastic. That type of versatility and richness speaks to the strength of the core ideas behind Badland. In a marketplace lousy with them, Badland is a well-considered and well-executed physics-based puzzle-platformer, tetchy controls notwithstanding. Badland‘s visual style is striking and mysterious, but it’s supported by slick design and the promise of future content in the pipeline — another set of levels is “coming soon," apparently. With all these things in mind, Badland is easy to reccommend.